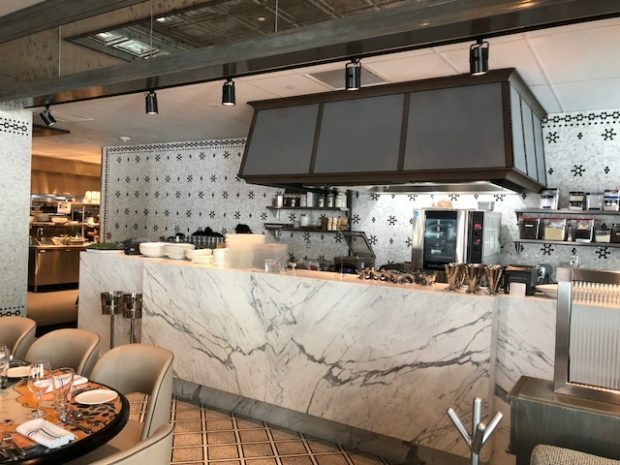 DFW foodies can now be transported to Paris via Toulouse Café and Bar and enjoy mouthwatering specialties a la Française in the sophisticated, French-themed atmosphere. Cocktails and wine, of course! The deluxe selection of wine at Toulouse will make you feel like you’re actually in Europe. If wine isn’t your thing, try one of the eight craft cocktails, like the Grapefruit Collins (with Belvedere vodka, lemon, agave and grapefruit soda). It’s a refreshing option that will make all your worries go away! There’s also a selection of bourbon, scotch and cognac worth sipping. 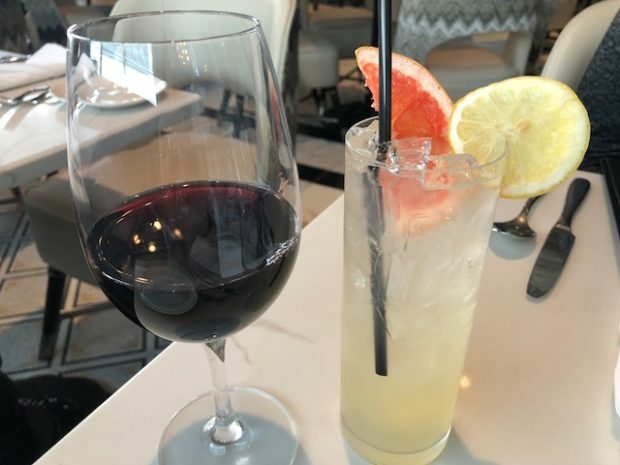 During happy hour, selected wines are marked down to $5 and some beer is $6. One of the cocktails, which will rotate during each day of Happy Hour, will be $7. Snacks during Happy Hour include several types of oysters for $1-2, mussels, cheese pastry puffs and more French nibbles. Why not start your meal with a cup of soup? 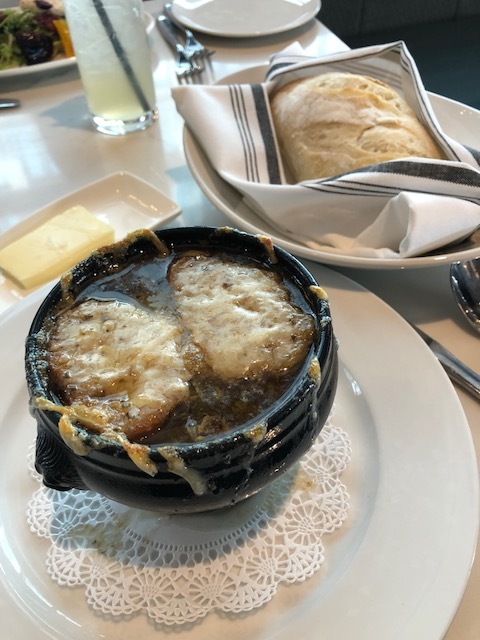 This French onion soup is served hot, hot, hot in a cute antique-looking bowl. The croutons are thick and soft, and the soup could even serve two people if you’re wiling to share. It lived up to the flavors I was looking for in this type of soup. The soup stayed hot throughout my dinner! Probably the most interesting appetizer was the Steak Tartar. 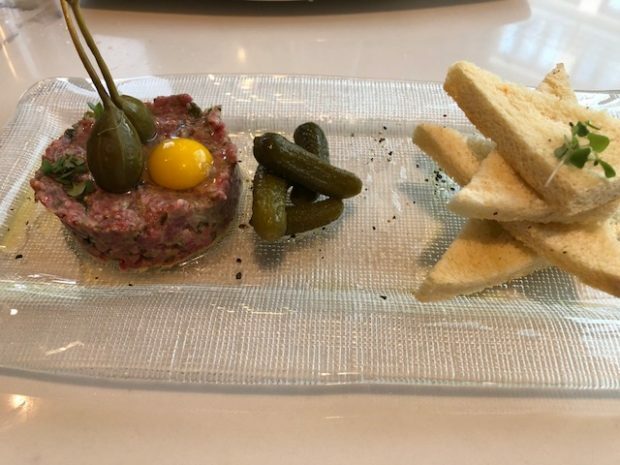 The sirloin is served completely raw and topped with a quail egg, capers, and pickles. Totally raw isn’t really my thing, but I know many people who live for this. I will say the presentation of the plate was well put together. 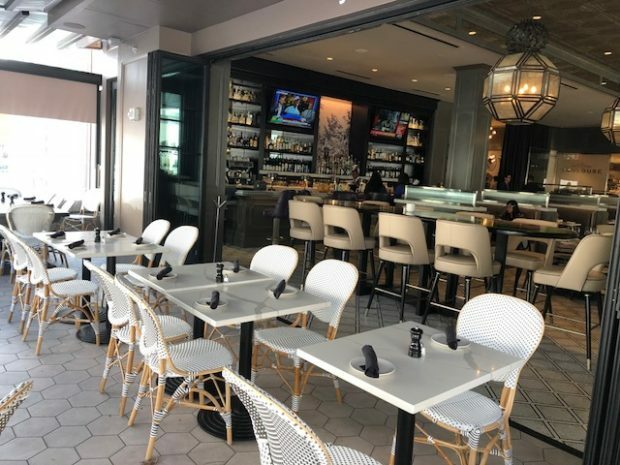 For seafood lovers, enjoy an oyster bar with up to 35 raw oysters from all over the U.S. 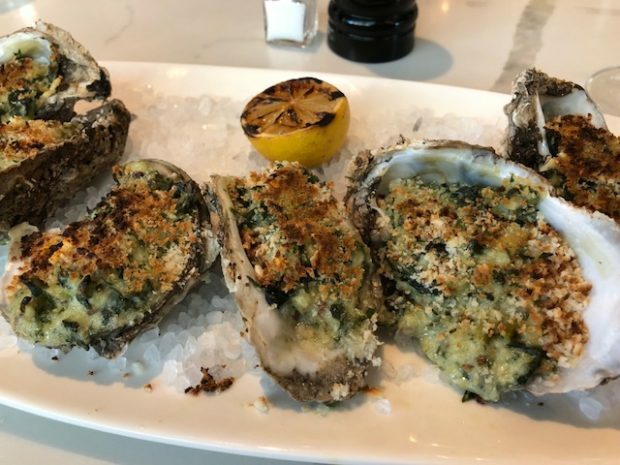 I opted to try the grilled oysters pictured above… creamy and delicate! Alas – dinner is served. Hope you’re in the mood for some more meat at Toulouse because they have lots of options to go around. This Steak Frites is a 12-oz New York Strip served with pommes frites (but we were trying to be low carb and swapped the fries for asparagus). 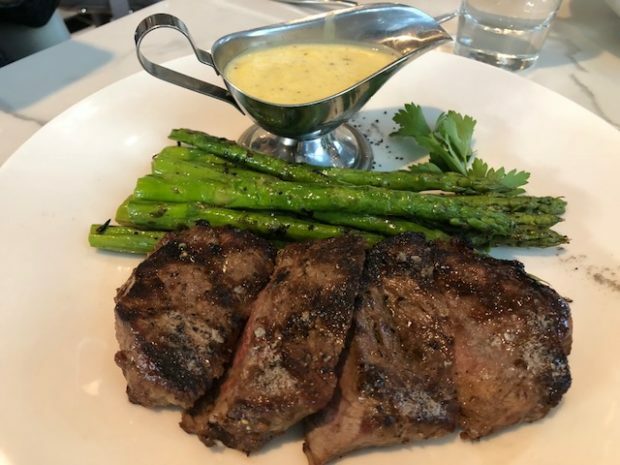 The buttery Béarnaise sauce complimented the well-seasoned steak. 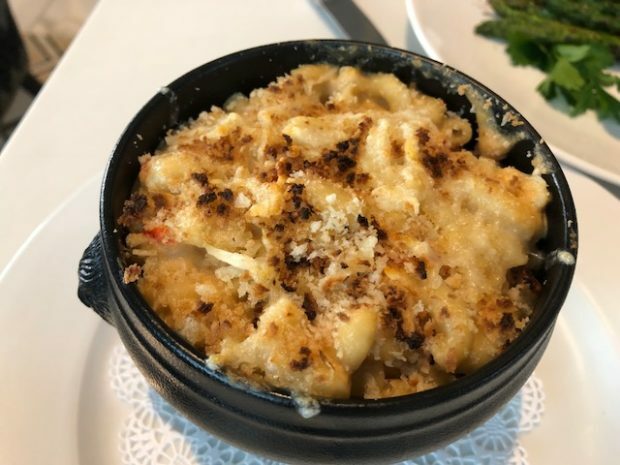 If I ever see a Lobster Mac n Cheese anywhere, I HAVE to get it. No questions asked. This one at Toulouse is creamy and full of lobster. No meal is complete without dessert, as least that’s what I think! The scrumptious chocolate souffle (with extra chocolate) is a must-have item for foodies with a sweet tooth. Be kind and share it with your dining partner. This is a BIG one! 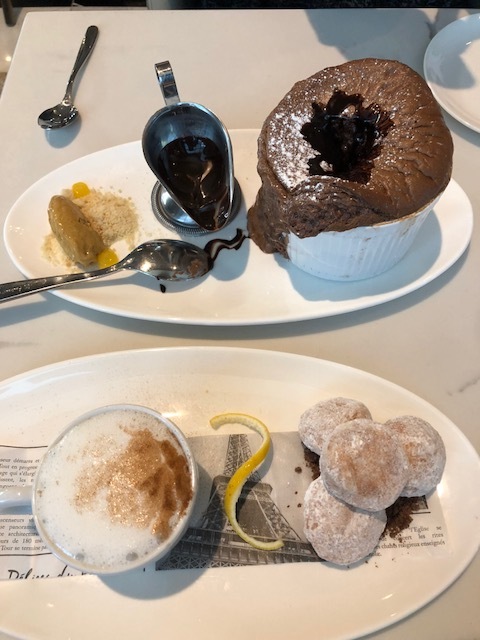 Another sweet hit is the Cappuccino Pot de Cream with homemade beignets. There are a few more dessert options too… all a winner in my book! I hope this daydream to France has inspired you to the visit the restaurant! 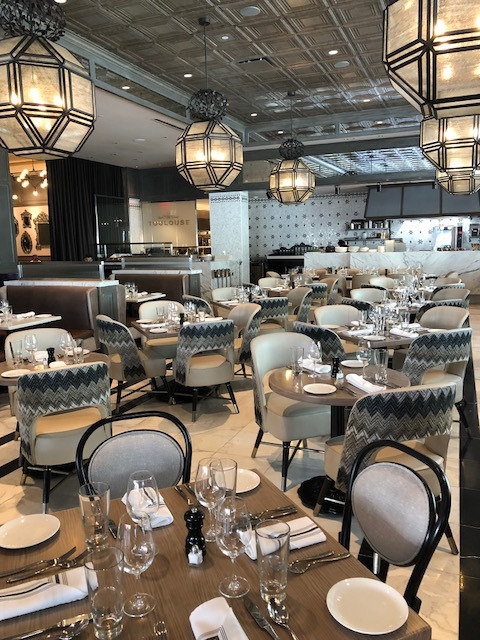 Toulouse is located at 7301 Windrose Ave. in Plano’s Legacy West. Check out their Facebook page to learn more about the restaurant. Disclaimer: Most of my menu sampling was complimentary, an all opinions are my own.